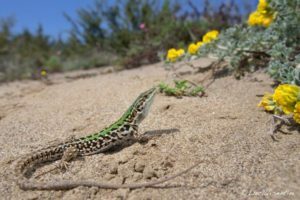 Check out our new paper on social learning in the Italian wall lizard, Podarcis sicula. This work formed part of Isabel Damas’ PhD thesis, and it was a huge effort! The question of what makes an invasive species successful compared to other species, that may fail to gain a foothold in a new location, is of great conservation interest. One idea is that it may have to do, at least in part, with their smarts. Animal use social learning as a short-cut to problem solving. Why figure it out for yourself when someone else can give you the answer? Humans do this all the time. While social learning is likely rampant, we rarely consider the possibility that species might use social information from other species. Italian wall lizard (Podarcis sicula). Photo by Luca Visentini. Figure 2. 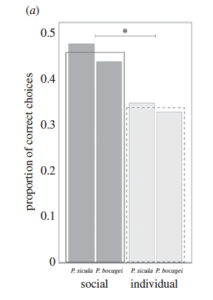 The proportion of correct choices during the task (a). The invasive Italian wall lizard is frequently found with other Podarcis. This sets the stage for heterospecific social learning. These (Podarcis) species are long-term residents in areas newly invaded by wall lizards. As such, they constitute an important source of information. 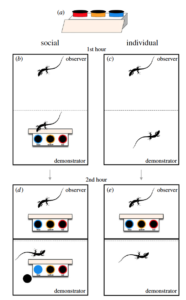 We tested the hypothesis that Italian wall lizards are capable of learning from other species. (Podarcis bocagei in this case). And low and behold they were! Check out the figures. To download the paper go here or send us an e-mail.